Guest instructor Nick Artemakis, (founder of Electric Woods) will guide you through the process of designing and constructing a pair of high quality 6 1/2” 2-way stereo speakers with premium drivers in a pyramid enclosure. A large part of what makes a really good speaker is careful, accurate craftsmanship. High standards of workmanship and neatness will be stressed. 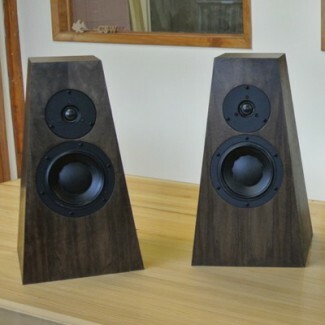 You will walk away with not only some very practical woodworking and electrical skills, but also a super deal on a pair of high-quality speakers that you built. Don’t let its simple shape and size fool you – the resulting bass is powerful, clean tight and natural. This is a serious, high quality sub. The unique design; compliments of speaker gurus G.R. Koonce and R.O. 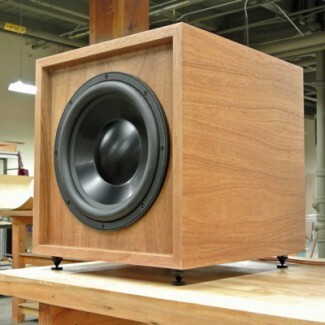 Wright of Speaker Build Magazine, is thoroughly engineered, and the build quality is “like a Tank”. Sound Bars are a great way to get all your music or home theater sound in one compact package: left, right, and center speakers. This sound bar is also a custom piece of modular furniture that can support your TV, hold electronic components, and store CDs and DVDs. You decide on the type of wood and the exact dimensions to suit your space and budget. Students will learn the fundamentals of speaker theory, design, and construction. Basic woodworking, electrical wiring and soldering will be introduced and reinforced with an emphasis on safety.